After years of being asked to develop a Killer B Motorsport Air/Oil Separator, we are nearing our release for the FA20 WRX Air/Oil Separator. This is a product we’ve been asked to develop for many years, and in that time there has been a lot of research, engineering, simulations, development, testing (and repeat), with several Subaru engines and build types. This has been going on over many seasons exposing to environmental extremes, and driving conditions (daily driving, auto-X, drag racing, dyno testing, etc. ), as well as on stock engines and exceeding 700whp. The goal of this product is simple. To function as its Air/Oil Separator description implies: the removal of oil, in liquid or vapor form, from the vented crankcase gasses. Simple in premise, but function wise there’s a bit more to it. Varying oil droplet sizes, with differing pressure and velocity conditions. Different engines with varying venting characteristics or a street car vs a track or performance elevated engine. The variable list goes on, making acceptable function and performance a difficult challenge. Performance must be spot on, but the effects on the engine’s operation must be unchanged at the least, or improved ad best. We prefer the later. This is accomplished by using a design that has no restrictions; media or baffles, to reduce the flow potential of the crankcase and head vents. Under positive boost conditions it will produce vacuum in the crankcase. The benefit of this is improved evacuation of crankcase gasses and the many other benefits that can be had with crankcase vacuum; improved ring seal, reduced oil consumption and improved power potential. 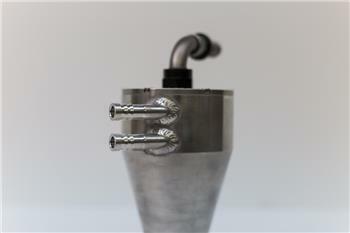 The Killer B Motorsport Air/Oil Separator functions with a vacuum source only, the turbo inlet. This provides the vacuum source for the crankcase. It is in no way effected by the turbo size, in fact a larger turbo that draws more air will improved separator function, compensating for increased venting requirements seen at improved performance levels. While small OEM turbochargers produce crankcase vacuum under boost, larger turbochargers produce more. Drain back design assures any oil that accumulates, ends up where it needs to be, in the oil pan assuring consistent supply to the engine. Six stainless steel bolts on the top, make it quick and easy for inspection and cleaning. It is not heated and we see no reason to add unnecessary cooling/heating (weight, complexity, increased install time, and increase probability of something leaking) and this simple engineered form functions just fine without it. The Killer B Motorsport Air/Oil Separator should meet and exceeds your expectations of how an Air/Oil Separator should work and function on a Subaru engine. Not only that, it will display some of the best eye candy fabrication available.